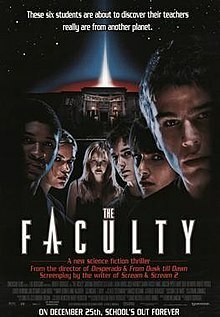 For the 1996 TV series, see The Faculty (TV series). For other uses, see Faculty. The Faculty is a 1998 American science fiction teen horror film written by Kevin Williamson, directed by Robert Rodriguez, and starring Elijah Wood, Josh Hartnett, Shawn Hatosy, Jordana Brewster, Clea DuVall, Laura Harris, Robert Patrick, Bebe Neuwirth, Piper Laurie, Famke Janssen, Usher Raymond, Salma Hayek, and Jon Stewart. The film was released on Christmas Day, 1998, by Miramax Films through Dimension Films. It grossed $40.3 million at the US box office. The film has developed a cult following in the years since its release. One evening at Herrington High School in Ohio, several teachers and Principal Drake leave after discussing the school's budget. When Drake returns to retrieve her keys, Coach Willis becomes increasingly erratic and stabs a pencil through Drake's hand when she attempts to leave. Drama teacher Mrs. Olson emotionlessly stabs Drake with scissors as she flees the school. The following morning, the students arrive, including Casey Connor, the dedicated but perpetually harassed photographer for the school newspaper. Casey is the unappreciated assistant to spiteful Delilah Profitt, the paper's editor-in-chief and head cheerleader. Delilah's mistreated boyfriend Stan Rosado is contemplating quitting the football team to pursue academics. Zeke Tyler is an intelligent yet rebellious student repeating his senior year. Tyler sells, among other illegal items, a powdery ecstasy-like drug he manufactures and distributes; he is confronted by Miss Elizabeth Burke, who expresses concern for him over his illegal activities. Naive transfer student Marybeth Louise Hutchinson befriends self-styled outcast Stokely Mitchell, who has deliberately spread rumors that she is a lesbian though she has a crush on Stan. Marybeth develops a crush on Zeke. Casey notices a strange creature on the football field and takes it to science teacher Mr. Furlong, who believes it is a new species of cephalopod-specific parasite called a mesozoan. Delilah and Casey hide in the teachers' lounge to find a story. They witness Coach Willis and Ms. Olson forcing one of the creatures into the ear of school nurse Ms. Harper. They also find the body of Mrs. Brummel. Casey and Delilah flee, and Casey calls the police. Principal Drake claims nothing is wrong and Casey is seeking attention. The next day, Casey tells Delilah, Stan, and Stokely he believes the teachers are being controlled by aliens. After Zeke and Marybeth tease them about their theory, Mr. Furlong confronts them. Furlong suddenly becomes defensive and attempts to infect them. Zeke cuts off Furlong's fingers, which keep moving on their own, and injects his homemade drugs into Furlong's eye, apparently killing him. Zeke takes the five to his house, where he experiments on a specimen retrieved by Casey. He discovers it needs water to survive and can be killed by his drugs. Zeke makes everyone take his drug to prove they are uninfected humans. Delilah is revealed as infected, and she destroys Zeke's lab and most of his drug supply before escaping. Acting on Stokely's speculation that killing the alien queen will revert everyone to normal, the group returns to the school, where their football team is playing and infecting opposing players. Believing Principal Drake to be the queen, they isolate her in the gym and fatally shoot her. Stan confronts the coach and team to see if the plan worked, but becomes infected himself. Zeke and Casey retrieve more of Zeke's drugs from his car. Casey leads infected students away from Zeke, who encounters Miss Burke in the parking lot and seemingly kills her while escaping. At the gym, Stokely becomes suspicious of Marybeth during a conversation about pretending to be what one is not. Marybeth subsequently reveals herself to be the alien queen; earlier on, she faked taking the drug. Casey and Stokely flee to the swimming pool, where Stokely is injured and becomes infected. Zeke and Casey hide in the locker room, where Marybeth reverts to her human disguise. She explains she is taking over Earth because her own planet is dying. Marybeth transforms back into her true form and hurls Zeke across the room into the lockers, knocking him out. Casey seizes the drug and tricks the queen into following him into the retracting bleachers, trapping her. He stabs the drug into the queen's eye. The queen infects Casey with her dying breath, but he almost immediately returns to normal upon her death. Casey returns to the locker room and finds Stokely and Zeke alive. One month later, everyone has returned to normal. Stan and Stokely, who has shed her Goth girl image, begin dating, and Zeke takes Stan's place on the football team (while Miss Burke affectionately watches him practice). Mr. Furlong has miraculously survived the attack, now sporting an eyepatch and bandages on his hand. Casey begins dating Delilah, who is no longer vindictive, and is considered a local hero as various newspapers reveal the attempted alien invasion is now public knowledge. In 1990, David Wechter and Bruce Kimmel wrote their first draft of the script and sent it out, but there were no buyers. It wasn't until after the success of Scream that Miramax bought the script and rushed it into production. Bob Weinstein and Harvey Weinstein brought in Kevin Williamson to do rewrites, keeping the basic story, but rewriting the dialogue and adding new characters to make it more "hip". Originally, Williamson was set to direct the film, but he chose not to so he could direct his self-penned script Teaching Mrs. Tingle. The Weinsteins brought in Robert Rodriguez to direct the film instead. On review aggregator website Rotten Tomatoes, the film received an approval rating of 53% based on 51 reviews, with an average rating of 5.6/10. The site's consensus reads, "Rip-off of other sci-fi thrillers." On Metacritic, the film has a score of 61 out of 100 based on 19 critics, indicating "generally favorable reviews." Audiences polled by CinemaScore gave the film an average grade of "B" on an A+ to F scale. The Faculty was viewed on 2,365 screens its opening weekend, debuting at #5 in the US, making $11,633,495. Its eventual US gross was $40.3 million. Mix Invasion Of The Body Snatchers with The Thing. Throw in some Terminator, a spoonful of The Breakfast Club, and a pinch of The Stepford Wives, and you've got a big mess of a movie set in a school that’s being taken over by a conformist alien, one teacher at a time. You’ve got the very funny, occasionally scary, quite gory, and extremely entertaining 1998 Robert Rodriguez film called The Faculty. Whiteley added, "It's all about examining the tropes of science fiction with a smart, funny angle. Half of the fun in this film is in identifying where you first came across a certain character's name or saw a particular special effect. For instance, there's a brilliant moment with a head on legs that I defy you to watch and not think of a certain John Carpenter film." Whitely concludes, "The Faculty is very definitely a big mess of a movie. But if you love all things sci-fi, it’s a good mess." Keith Phipps described the nostalgic homage when he described the film as "a Kevin Williamson-scripted high-school variation on Invasion Of The Body Snatchers." The score is composed by Marco Beltrami, who had previously scored the teen-slasher-horror film, Scream, as well as Mimic. Both Beltrami's score and songs by various artists used in the film were released as albums. The "music from the motion picture" album features songs by various indie and alternative rock groups. The Faculty takes place in fictional Herrington, Ohio, but was shot in Austin, San Marcos, Dallas, and Lockhart, Texas. The Faculty was one of the few Robert Rodriguez films not to receive special treatment on DVD. Missing are traditional extras typical for a Robert Rodriguez DVD including "10 Minute Film School", audio commentary, and making-of featurettes. Several scenes involving an additional character named Venus, played by Kidada Jones, were shown in TV previews for the film, as well as Tommy Hilfiger commercials, but cut from the film. She is also visible in a scene in the theatrical version, standing next to Gabe (Usher) in Mr. Furlong's (Jon Stewart) science class when they are looking at the "new species" in the aquarium. The Faculty was released in several countries on Blu-ray, including Canada on October 6, 2009, by Alliance; in Australia on September 1, 2011, by Reel; in the United Kingdom on October 3, 2011, by Lionsgate, in Germany on October 6, 2011, by Studio Canal; in France on January 10, 2012, by Studio Canal; and in the United States on July 31, 2012, by Echo Bridge Home Entertainment. Lionsgate re-issued the Blu-ray version in the United States on October 7, 2014 after Echo Bridge lost the rights to the Miramax films. The film was nominated for a total of eight awards, including an ALMA Award for director Robert Rodriguez, 2 Saturn Awards, 2 Blockbuster Entertainment Awards and 3 Teen Choice Awards, but did not win any. ^ a b c d "The Faculty (1998)". Boxofficemojo.com. 1999-05-21. Retrieved 2010-10-20. ^ Barry, Angie. "Under the Radar: Genre Movies You May Have Missed — The Faculty". Criminalelement.com. Retrieved 28 August 2017. ^ Goldstein, Patrick. "The Faculty". LA Times. Retrieved 2012-09-29. ^ "The Faculty (1998)". Rotten Tomatoes. Fandango. Retrieved April 22, 2018. ^ "The Faculty Reviews". Metacritic. CBS Interactive. Retrieved April 22, 2018. ^ "'Patch Adams' Just What Holiday Ordered". Los Angeles Times. Retrieved 2012-06-07. ^ a b c Whiteley, Aliya (11 Oct 2013). "Revisiting Robert Rodriguez's The Faculty". Dennis Publishing. Retrieved April 21, 2014. ^ Phipps, Keith (February 14, 2002). "Robert Rodriguez: Interview". The A.V. Club. Retrieved April 21, 2014. ^ Other reviews by David A. Koran (2001-06-23). "The Faculty (2000) Soundtrack". Soundtrack.net. Retrieved 2010-10-20. ^ "The Faculty Blu-ray". Blu-ray.com. Retrieved 2017-08-28.